Discover The Palm Beaches (DTPB), the official tourism marketing corporation for Palm Beach County, is celebrating Global Meetings Industry Day (April 6) by announcing 2016 as DTPB’s highest convention booking year in its history. The organization achieved a remarkable 94 percent year-over-year increase in room nights sold through its groups and meetings bookings. The announcement follows other positive news for the destination, including record-breaking tourism numbers for 2016 of 7.35 million visitors, and a year-over-year increase in visitor spending. Tourism is among Palm Beach County’s major industries, supporting more than 66,000 jobs with an economic impact of approximately $7 billion. DTPB President and CEO Jorge Pesquera credited the dramatic increase in groups and meetings business to a combination of factors, including an integrated approach to selling and servicing citywide events with the Palm Beach County Convention Center and downtown West Palm Beach hotels, a powerhouse team of group sales staff members at DTPB, a beautiful destination often referred to as “paradise,” and a variety of hotel products throughout the county that are particularly desirable to groups. DTPB Senior Vice President, Group Sales Kelly Cavers said the organization now has additional opportunities to host larger, citywide events. “The recent opening of the Hilton West Palm Beach, physically connected to the Palm Beach County Convention Center, has elevated West Palm Beach’s convention district as a fresh new option for meetings and conventions. This walkable convention district package is particularly appealing to meeting planners, as it showcases a diversity in hotel products, such as the Marriott West Palm Beach and Hyatt Place West Palm Beach, combined with easy access to offsite dining options at CityPlace,” Cavers said. The Palm Beaches’ wide array of support services and the experienced professional staff members help to ensure an efficient, memorable and exceptionable convention and meetings experience from the first moment you contact the organization. In addition to the complimentary planning services currently offered by DTPB staff, any groups and conventions booked at the Palm Beach County Convention Center can take advantage of a new banner program. Banners will now announce a company’s arrival by displaying the logo in a prominent location on Okeechobee Boulevard, a highly-trafficked street in the heart of downtown West Palm Beach. The event also will be promoted in the convention center through additional signage. Groups and meetings attendees can also utilize The Free Ride, gas-free electric shuttles, which transport passengers from the convention center to popular spots, such as Palm Beach and area attractions. This service is sponsored by DTPB. DTPB offers “Dine Around” options at CityPlace, an outdoor shopping plaza, and in Downtown West Palm Beach on Clematis Street, a popular dining destination. DTPB staff members will provide assistance with housing options for citywide group events requiring multiple hotel stays, as well as destination marketing materials to incorporate into event websites, including the creation of social media presence for events. The Palm Beach County Convention Center presents a spectacular setting for conventions, trade shows, meetings and social events. An architectural masterpiece with state-of-the-art amenities, the 350,000-sf center features a 100,000-sf exhibit hall, a 22,000-sf ballroom and 21,000 sf of flexible breakout space divisible into 19 rooms. 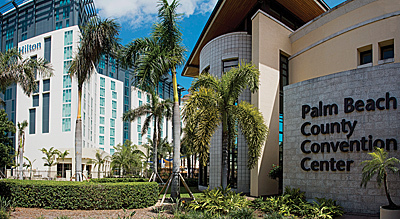 The Palm Beach County Convention Center welcomed a connected 400-room convention center hotel, Hilton West Palm Beach, in 2016. The center recently added new scenic photography to the hallways of local outdoor destinations featuring Palm Beach County’s famous white sandy beaches, water reserves and its beautiful landscape. Ensuring security is a top priority, the center added new card access systems throughout all rooms in the building, as well as in the back of the center entrance. The convention center updated 14 LCD monitor systems with new cutting-edge software, allowing the center to broadcast local weather, news, restaurants and attractions and upcoming convention center events. New food & beverage equipment allows the culinary department to produce some of the most decadent delicacies in the food industry. Ongoing projects include new LED lighting with expected completion later this year, and new carpeting expected in 2018. Since June 2014, Palm Beach County has added 635 new hotel rooms. Another 708 rooms are under construction and are expected to be completed by 2018. This January, another exciting development opened in downtown Boca Raton. The new 200-room, 13-story Hyatt Place hotel is in the heart of downtown, and is only one mile from the blue waters of the Atlantic Ocean. The Boca Raton Mandarin Oriental is set to debut in downtown Boca Raton in 2018. The 158-room property will include two adjacent towers that will form part of an upscale mixed-use development. The property will feature 65,000 sf of luxury lifestyle retail, as well as a world-class private club, which will offer social, fitness, spa and championship golf amenities. It will offer extensive banqueting and meeting space, including an expansive 4,500-sf ballroom and a variety of adaptable conference rooms. This is Mandarin Oriental’s second property in Florida. Later this year, ground will beak for the Aloft Delray Beach in the SofA (South of Atlantic Avenue) district. Developers expect the 122-room hotel to open in 2018. In West Palm Beach, a new 14-story, 150-room Canopy by Hilton Hotels also is expected to break ground later this year. The brand’s concept is touted as an energized and natural extension of its neighborhood, with local design, food and drink, and culture. It will be located just two blocks from CityPlace. In fall 2016, the AAA Four Diamond Palm Beach Marriott Singer Island Beach Resort & Spa unveiled the results of its $6.8 million renovation that infused the popular resort with a relaxed, breezy coastal style. The new design blurred the lines between indoor and out, bringing ocean-inspired colors and textures in, while encouraging guests to step out and enjoy the fresh air and beachfront setting. Renovated areas include the guest suites, lobby area, dining and meeting spaces. Waterstone Resort & Marina, an upscale, art deco, waterfront resort hotel in Boca Raton, was announced as one of the newest additions to Curio – A Collection by Hilton in October 2016. The 11-story boutique hotel’s 139 guest rooms and suites offer private balconies with panoramic views of the Atlantic Ocean, Lake Boca or the Intracoastal Waterway. A particularly distinguishing feature is the Waterstone Resort & Marina’s nearly 200 feet of boat docking facilities and promenade. It serves as the centerpiece for watersports, boating and sailing options, as well as enchanting waterfront dining. Earlier this year, the Hilton Palm Beach Airport also completed their new 9,300-sf Majestic Ballroom, which can accommodate up to 1,000. At the newly-revitalized Spa at PGA National Resort & Spa, guests are pampered with more than 100 treatments amidst lavish amenities and a newly-updated decor. Guests can relax in the sleek new ladies’ lounge area, complete with softly lit wall décor, new furnishings and a tea bar with fresh citrus. Ladies can revel in the recently re-designed wet area, featuring a new sauna, steam room, and state-of-the-art locker room. Brightline, the express inter-city passenger rail service, is expected to begin this summer. The train will connect West Palm Beach to Fort Lauderdale in 30 minutes, and later this fall is expected to connect Fort Lauderdale to Miami in 60 minutes. Phase two of Brightline will connect West Palm Beach directly to the Orlando International Airport’s in just two hours. The destination welcomed six new restaurants to critical acclaim, all of which offer groups private dining areas or buyouts of private space: Grato, a modern Italian trattoria-inspired restaurant in West Palm Beach; C.W.S. Bar + Kitchen, offering a craft beer garden and rustically cozy and inviting whisky bar in Downtown Lake Worth; The Regional Kitchen & Public House in downtown West Palm Beach, opened by celebrated South Florida chef and season nine “Top Chef” finalist Lindsay Autry, along with partner and seasoned restaurateur Thierry Beaud; Bowery Palm Beach in West Palm Beach outdoor shopping plaza CityPlace, led by Bowery Founders and TV reality stars Joe Cirigliano and Karena Kefales; Sant Ambroeus Palm Beach, the popular Milan-based restaurant specializing in Italian cuisine; and Costa, one of the newest eateries on Palm Beach focused on classic flavors of Mediterranean cuisine, located in Worth Avenue’s Esplanade. The Ballpark of The Palm Beaches opened last month for Spring Training 2017, welcoming the Washington Nationals and the Houston Astros, along with their many fans. The state-of-the-art, two-team facility offers a fan-friendly layout with a 6,500-seat stadium as its centerpiece. The Astros and Nationals training areas each feature a six-field layout that is inviting and easily navigated by fans. A New Market Tour & Cooking Class is being offered twice a month by West Palm Beach Food Tours. Guests can join cookbook author and restaurant critic, Judith Olney, for their market tour and cooking class. The epicurean experience includes an insider’s tour of a local market and a hands-on cooking class with lunch and wine for $95. Market locations vary and include the award-winning West Palm Beach Greenmarket, an Oriental Market, an Italian Market and a Mediterranean Market.